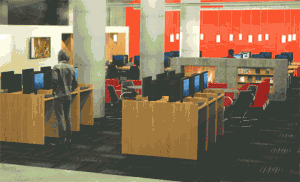 On April 4, Koerner Library began welcoming students to its innovative and inviting new space on the main floor. UBC Library is dedicated to enhancing student learning and spaces – and Koerner’s refurbishment, which began last fall, is an important part of that process. The result is a savvy space that will appeal to solo and group studiers, as well as those who crave a bit of rest and relaxation during a busy school schedule. When possible, materials were reused. For example, while the study tables feature new wooden tops, their chrome legs previously belonged to tables from the old Law Library. Meanwhile, older carrels have been moved to level one of Koerner for continued student use. We’re excited about our new space – and we invite you to visit us at Koerner and enjoy the surroundings! Please visit our Hours and Locations page for more information on Koerner and other UBC Library branches and divisions.